Two goals in the closing stages by Ken Oman secured a vital victory on Saturday for Portadown. Carrick Rangers moved into a 2-0 advantage at half-time in the Danske Bank Premiership clash. 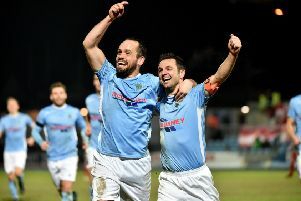 Two-goal hero Ken Oman (left) celebrates with, from left, Tim Mouncey and Darren Murray during the dramatic weekend win for Portadown against Carrick Rangers. Pic by PressEye. The Ports finished with 10 men - following a red card for Garry Breen - but full points on a 3-2 scoreline. Gary Twigg kicked off the comeback before Oman headed home a dramatic double. The result provided Portadown with a welcome win following six successive defeats across all competitions. Footage courtesy of ‘Ports TV’.